iLearn Math is the internet-delivered software from iLearn that manages the entire math intervention process. In brief, it assesses, prescribes, instructs and reports. The bottom line: It delivers results in math. iLearn Math delivers the curriculum and gives the student just the right amount of instruction and practice necessary to understand and retain the concepts being taught. Students cannot proceed without mastering the material at each level. The iLearn Math management system keeps track of the results and reports them to the teacher on demand. It’s the closest you can come to a highly-skilled tutor for each student. Requires true mastery. Students can’t guess their way through the program, since it’s not based on a multiple-choice format and they must generate their own answers. Is not based on cartoons or a game format; it’s real education. Greatly reduces teacher workload by automating time-consuming tasks, such as planning lessons, writing tests or grading papers, which frees up the teacher to work one-on-one with students. Improves student morale, which results in fewer student behavior problems. Motivates students by allowing them to see success every day, regardless of their abilities. The bottom line? 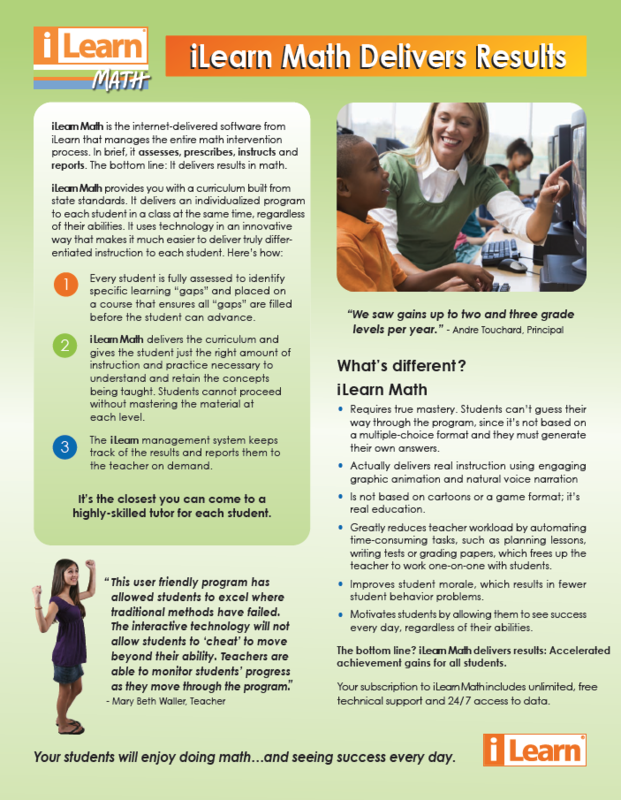 iLearn Math delivers results: Accelerated achievement gains for all students. Your subscription to iLearn Math includes unlimited, free technical support and 24/7 access to data. Your students will enjoy doing math…and seeing success every day.